Worldwide Technical Service. With a view to reinforcing the technical service and providing customers with better care, in 2012 E&M created a specific department to cater for the entire process, from the commissioning of the industrial burners made by the company, through to the maintenance, repair and replacement and supply of spares for on-site equipment. 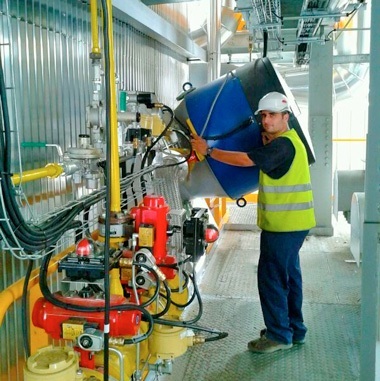 Saudi Arabia, Mexico, Romania, Poland… these are just some of the countries in which the E&M Combustión technical service has been deployed in recent months in order to ensure the proper operations of several plants throughout the world. Based on experience accumulated over fourteen years in this sector, we provide a service for facilities in renewable energies, steel, petrochemicals, food and beverages, pharmaceuticals and the automotive industry. Seen as a key process for keeping plants operational and fine-tuning their performance, the proper running of many facilities also requires a regular review and inspection of their equipment. We also conduct audits on energy saving, which enable us to replace existing burners with new generation electronic industrial burners models, with low NOx, fitted with frequency adjusters, O2 and CO probes and touch-screen for interfacing with the plant’s DCS. The payment plan for customers is a pleasant surprise.